This article originally appeared in the Fall 2004 issue of Opus magazine. Back in 1976, a 20-year-old violin student at the Juilliard School named Peter Oundjian unexpectedly found himself receiving a conducting lesson from Herbert von Karajan. The great maestro was in New York to give masterclasses for Juilliard’s conducting students, when Oundjian – who was at the time the Juilliard Orchestra’s concertmaster – was put on the spot. With a wry smile, he adds, “They played their hearts out – not for me, for Karajan! But he did say to me, ‘You have fine energy in your hands.’ It was something that stayed in my mind.” Karajan’s remark proved strangely prophetic: in 1995 Oundjian set aside his violin for a conductor’s baton (something else he would never have expected, back in 1976); and – in more ways than one – it was all because of the energy in his hands. His ascent to the podium was via an indirect route. After graduating from Juilliard, Oundjian pursued a career as a concert artist, and in 1981 was named first violinist of the Tokyo String Quartet. For the next 14 years he performed in about 2,000 concerts with the Tokyos all over the world, and spent many long hours in studios, recording cycles of Beethoven, Schubert and Bartók quartets. But just when he was at pinnacle of his success as a violinist, it all began to unravel. Faced with the kind of career meltdown would have sent many a musician spiraling into oblivion, Oundjian formulated a plan. In December 1994 he privately told his colleagues in the Tokyo Quartet that he would leave the group in May. He also contacted his friend André Previn, director of the Pittsburgh Symphony Orchestra and also of the Caramoor Festival in New York State, and told him he was thinking of pursuing a musical interest that had been in the back of his mind for years. “André Previn was extremely generous and kind,” says Oundjian, looking back on this time of transition. “He invited me to his house to talk about conducting. By the end of that meeting I felt incredibly inspired. And he invited me to lead the Orchestra of St. Luke’s at the opening night of Caramoor’s 50th-anniversary season.” The musical world lost a violinist but gained a conductor. But he still had a lot to learn, so in the winter of 1995 he began to take conducting lessons from Previn and others. He also found a respected New York agent who was willing to take a chance on him – and within three years of his Caramoor Festival debut he was named Artistic Advisor and Principal Conductor to the festival (a title he still holds) and also Music Director of the Nieuw Sinfonietta Amsterdam (a position he relinquished last year). He’s also appeared in such European cities as London, Zurich, Frankfurt, and Monte Carlo; but he’s been busiest in North America, where he has guest conducted the orchestras of Boston, Philadelphia, Chicago, Los Angeles, Houston, San Francisco, Cincinnati and Salt Lake City, amongst others. Last year he was appointed Principal Guest Conductor of the Colorado Symphony, in Denver. And then there’s Toronto. 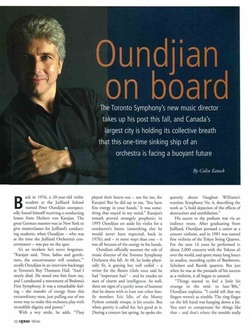 Oundjian first appeared as a violin soloist with the TSO in 1981, and as a guest conductor in 1998. But his connection to the city goes back much further than that: he was born in Toronto in 1955, into a family of Armenian, English and French ancestry who were in the carpet business. However, just five years later his parents packed up their rugs and children and moved to the UK. Oundjian grew up in Surrey, where he acquired the soft accent that graces his speech. The “trouble” he speaks of was the near bankruptcy of the TSO in 2001. At the time, the orchestra had no conductor, no manager, no cash – and speculation was rife that it also had no future. It was hardly an auspicious time for the organization to be looking for a new music director. “Quite honestly,” Oundjian points out, “why would a European conductor who’s got many choices and possibilities be troubled with a city that is obviously having a dysfunctional relationship with its orchestra? But for a guy who’s born here, and who believes in the city, it can be a calling. Something about it just told me it was something I should do – that I could make a difference.” His appointment, announced on January 16, 2003, had all the markings of a match made in heaven: the TSO needed a new conductor who could revive the orchestra’s prospects, and Oundjian, after years of guest conducting, needed an orchestra to call his own. But it’s also been noted that he has not, as yet, shown any sign of moving to Toronto. Although he has a flat in town, his real home is in Weston, Connecticut, where he lives with his wife and two children. This is an issue that goes beyond mere window-dressing: these days a music director must also be an administrator, a fundraiser and a publicist – “someone who takes a real interest in the community,” as TSO President and CEO Andrew Shaw put it, when the orchestra was maestro-shopping. However, if Oundjian prefers to get his hair cut in New England, at least that’s not as far as the last conductor went for a trim: Jukka-Pekka Saraste’s barber was in Finland. Since the TSO’s near-death experience three years ago, the orchestra’s fortunes have been on an upswing. Extensive work on Roy Thomson Hall resulted in substantial improvement to the Toronto auditorium’s acoustics. The orchestra’s finances have been stabilized, and subscriptions have increased. So Oundjian has good cause to be bullish about the TSO – he’s clearly enthusiastic about his new job, and he comes equipped with well-considered ideas about his role as music director.